With this incredible pizza onesie, you're totally allowed to skip the napkin and wipe your greasy, cheesy, sauce-covered fingers right on your clothes. 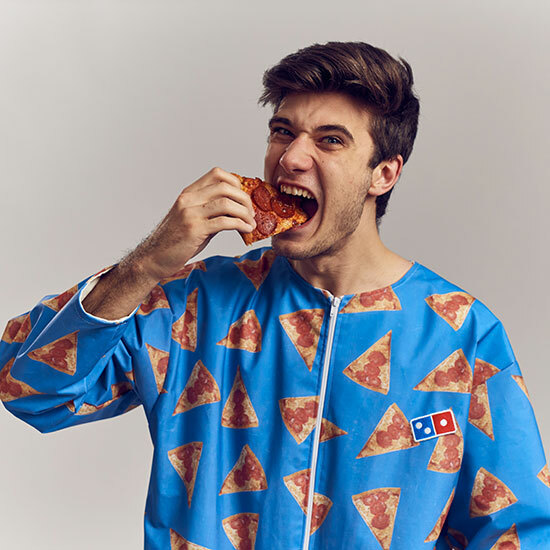 Thanks to Domino's U.K., you can now eat pizza while wearing a delightful onesie designed just for your pizza-eating experience. According to Domino's, this strange little garment is made from "stain proof fabric with soft velveteen for comfort and resilience." Basically, it's a slob's best friend. The onesie, created by Charlotte Denn of Make & Mend Seamstress, went on sale New Year's Day, and sold at U.K. Domino's locations for £25, which is about $31, which is about three 14" Domino's pizzas. Along eliminating the need for napkins, this onesie also boasts two large pockets, one on each side, "to store dips and drinks." So basically, whether you're getting over a breakup, taking full advantage of the weekend's relaxation potential, or just a generally lazy person, this onesie is pretty much a dream come true. The only thing keeping this onesie from achieving total lazy day perfection is the fact that it, alas, isn't a footy onesie. You'll just have to wear it with your favorite pair of pizza socks. One other piece of good news: By succumbing to the laziness of the wipe-able pizza onesie, you're also making the world a better place. Domino's is matching the £25 from each sale of the onesie and donating all the proceeds to the Teenage Cancer Trust and other charities. So yeah, you should order a lot of pizza and not use a plate or a napkin. For charity.